The holy grail for many printmakers is to be able to print a dense black. In etching this can be achieved through mezzo tint or using a lung damaging resin which is melted on to the plate. 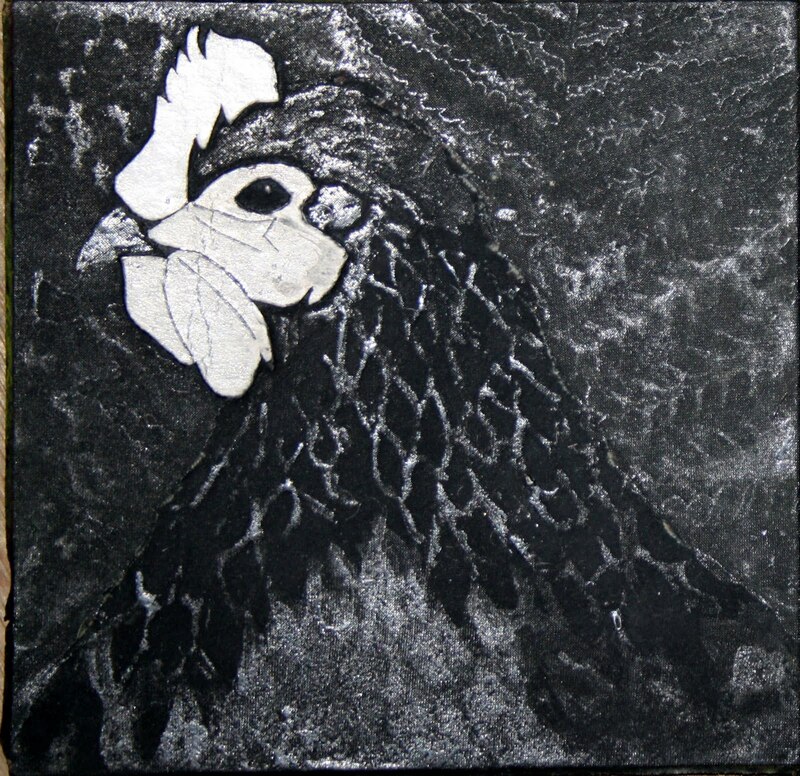 For collagraph printmakers it is usually carborundum grit, difficult to ink and only really useful in large areas. 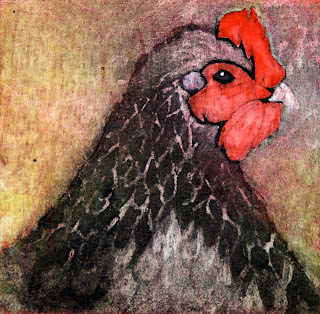 Easier to handle and wonderfully affective is silk aquatint. Using chiffon or silk attached to the card plate using acrylic paint, tones are then introduced using acrylic gel mediums and PVA glue in various layers, the white area on the above plate is a thin piece of card with detail scored into it. When inked with colour the plate prints like this. 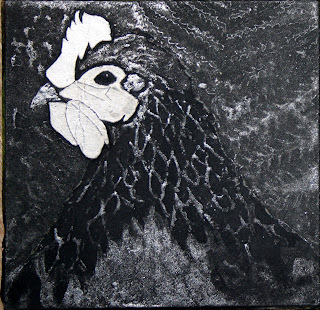 This silk aquatint has tile cement with leaves and wall paper pressed into it to make the textures. The resulting print is full of subtle tonal contrasts. 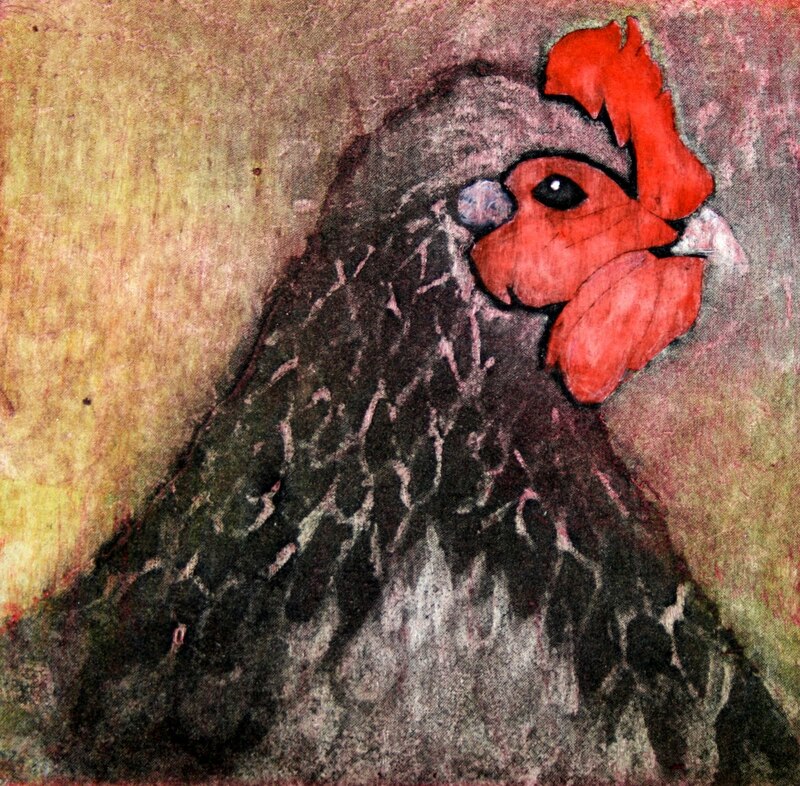 The chicken print is 5ins x 5ins and the rook is about 10ins x 5ins. Inspired by these 2 experiments I am now working on a much larger piece, wish me luck! Good luck! I really love that rook, I've been fascinated lately with watching the crows and magpies building their nests and fighting over territory. I love the textures in both of these prints. Loving the rooks....... such lovely, lovely texture. Good luck. You don't really need it. I already love your work. I've just learned of this technique today. Your prints are beautiful!